With so many options to choose from, it can be overwhelming to narrow down your choices for the perfect jogging stroller. 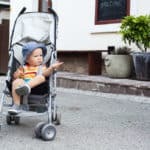 You want to ensure that you will have this stroller for the duration of the baby and toddler years, and that it will continue to hold up through typical wear and tear. We worked hard to examine the Urban Glide, and have created a comprehensive review to help you to determine if this stroller is the best option. Read on to find out! 2 Who Can Benefit from a Jogging Stroller? The first thing to consider is the type of jogging that you do. If you mostly jog on smooth terrain, a basic jogging stroller will work for you. However, if you engage in trail running, you may want to consider a stroller with larger wheels and a suspension system to ensure your child is comfortable. 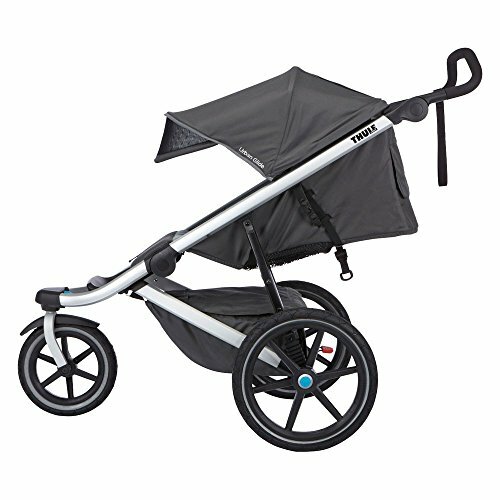 If you need to transport the stroller to where you run, you will want one that you can fold. Measure the space in your vehicle and then look at the folded size of the stroller to make sure that it will fit. The handlebar height should be adjustable. It is imperative that your arms are at a comfortable angle when you are jogging to get a good workout. If several people share this stroller, the handles should adjust to accommodate all of their heights. Consider the child positioning options. Ideally, the seat should adjust for the child to be upright and for them to take a nap. Ensure that the harness keeps your child in place securely when you are moving. To help you compare the Urban Glide to other options so that you make the best choice, we have compiled a list of the best jogging strollers for you. Who Can Benefit from a Jogging Stroller? A jogging stroller allows you to maintain your workout schedule without needing to leave your child at home. Their design allows for maneuverability so that you can continue with the running style you prefer with your child in tow. These strollers have space for your water bottle and other essentials you may need when you are jogging. They usually have better tires and suspension so that your child has a smooth ride even when you are running on trails or at a fast pace. 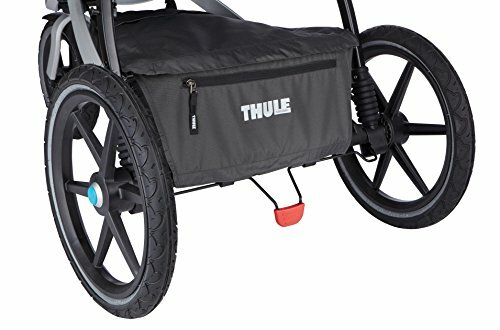 The Thule Urban Glide Stroller is an option for those who want solid maneuverability so that it does not interfere with their runs. It weighs 23 pounds, so it is easy to push even when you are jogging at a fast pace. This stroller has sufficient storage to carry your essentials. The handlebar is adjustable, and the canopy provides adequate coverage for your child. 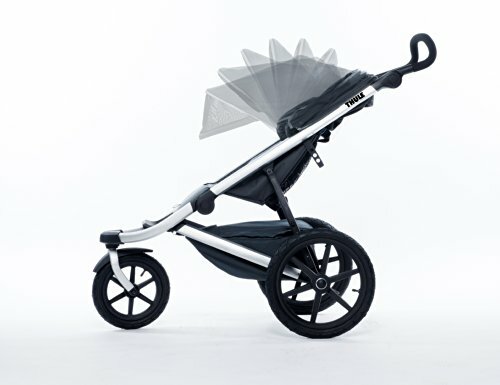 The Thule Urban Glide Stroller is a viable jogging stroller that has all of the features you need to get in a good workout while you spend time with your child. This stroller has the safety and comfort features necessary to ensure that both you and your child have an enjoyable time outdoors. It is vital to have good coverage for your child when you are running outdoors. The canopy on this stroller allows you to shield your child from the weather and direct sunlight. The canopy has two panels and a sun visor that pops out for additional protection. When you are not using the canopy, you can tuck it away so that it does not obstruct your child’s view of the scenery. The visor has a “follow-the-sun” ability that ensures that your child has the most shade no matter the time of day. Use the peekaboo window in the canopy to see your child to ensure that they are safe as you are moving around. Check out this video from Thule to see the canopy and other features in action. You can adjust the handlebar to ensure a comfortable height for all people who use this stroller. You can adjust it from 39 to 45 degrees. The foam covering keeps your hands comfortable. and this material prevents hand slippage if they get sweaty. The handlebar has a safety strap that you can move right to the left, according to your preference. The seat is 15 inches wide so that it can accommodate your child as they get bigger. The height of the seat back measures 21 inches, allowing taller children to be comfortable when they are in the stroller. The overall size of these components allows you to use this stroller with babies and toddlers. There are different reclining positions that allow your child to sit upright when they are awake or lean back when they want to take a nap. The vent component of the seat ensures comfort no matter the outside temperature. The leg rest has padding for comfort. You can transition this component into a footrest as your child grows. Easily adjust this element and the seat using one hand so that the transitions and adjustments are quick and easy. The five-point harness makes sure that your child is safe and unable to escape from the stroller. There are two buttons that you have to push simultaneously to release your child. Babies and toddlers are not able to operate these buttons. This stroller features a large basket and pockets to store the essentials when you are out. The mesh pocket is the ideal place to put your important items, such as your keys or wallet. Inside the seat, there are two small pockets that are ideal for snacks. Below the seat sits a large basket. This basket is a good place to put baby clothing, diapers, and other larger items you want to take with you. It has a lid that secures with Velcro so that nothing falls out when you are running. The brakes are single-action style so that you can quickly engage them when you need to stop the stroller. The pedal sits in the center of the rear axle, so it is easy to access when you are moving. This stroller features three wheels, with the two rear wheels being larger than the single front wheel. This design makes it easy to navigate around twists and turns when you are running. The rear wheels have a suspension to ride over bumps or curbs smoothly. The tires are pneumatic to further reduce shock and ensure that they are durable. 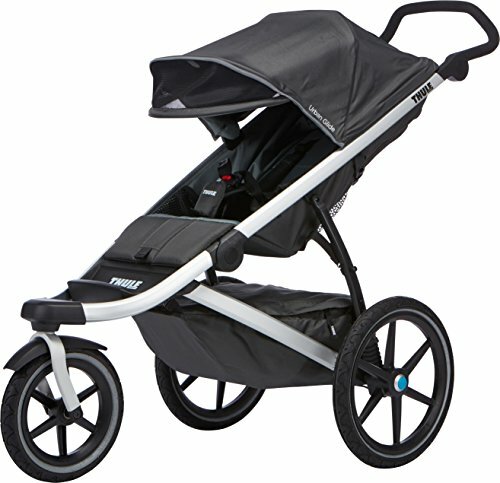 The Thule Urban Glide allows you to maintain your active lifestyle with your baby. 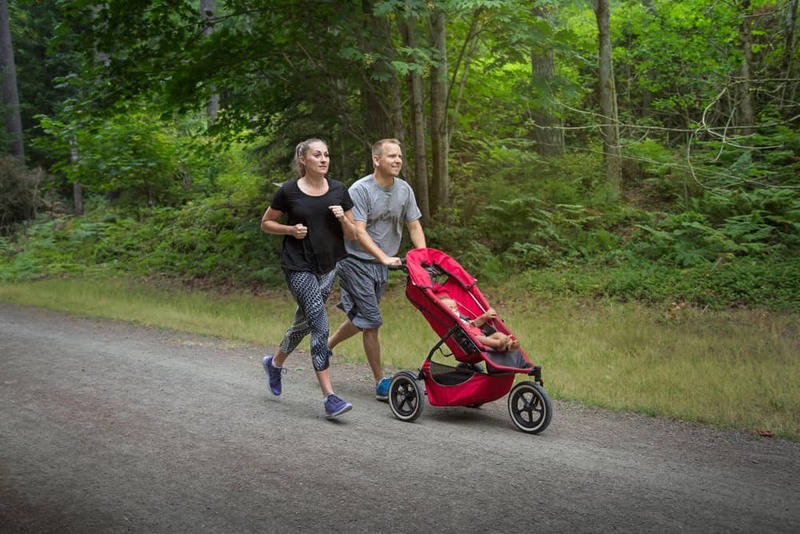 Whether you are training for a marathon or just going on a casual jog, this stroller makes it easy and comfortable to take your baby along. If you have more than one child that is stroller age, you might consider exploring double jogger strollers. These strollers allow you to job with two kids in tow. This stroller folds up easily, so you can transport it to your favorite running spots conveniently. When folded, it is small and light, so it will take little effort to get it into and out of your vehicle. Due to the design of the wheels, this stroller is easy to maneuver. If you jog on trails with a lot of twists and turns, this stroller will not slow you down. However, if you do need to slow down quickly, the brake system works efficiently to keep you and your child safe. With a wide seat, you can continue to take your child on jogs for a long time without them getting uncomfortable. Use the recline features to allow your child to get into a position where they can kick back and relax. 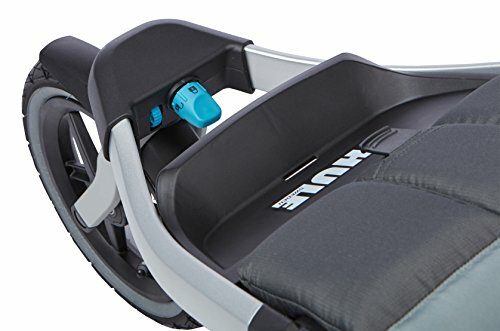 Even on the hottest days, your child remains comfortable since this stroller has vent areas. These vents ensure optimal airflow when you are running. However, if you are out on cold days, you can cover them to keep your kid warm. The harness is easy for you to operate, but a baby or toddler cannot unlock themselves and escape the stroller. The shock absorption abilities of the wheels further promote comfort when you are rolling along. Take advantage of the storage options so that you can keep the essentials within reach when you are out. The mesh pocket zips so that nothing will fall out if you hit bumps during your run. The basket is a good choice for bigger items, such as diapers and backup bottles or sippy cups. Good luck in your search to find the best stroller to accommodate your family!